By What You Need to Know Before a Medical Emergency Ferdinando L. Mirarchi, D.O. Is Your Living Will Compromising Your Safety? If you have a living will, you probably had it prepared so your wishes could be carried out if you became incapable of making your own medical decisions. But, did you realize there is a risk of your living will being misinterpreted? Patients who are not terminally ill die in hospitals every year because of medical staff misinterpretations of living wills. These are patients who would have otherwise lived if treated. But, too often, patients with living wills are treated as DNR—a code status understood by physicians and staff to mean “do not resuscitate.” However, in many cases their status should have been “Full Code,” which tells those in authority to use aggressive efforts to save patients’ lives. Unfortunately, living wills do not contain patient code status designations and therein lies the problem. How can you be sure your living will makes your wishes clear? 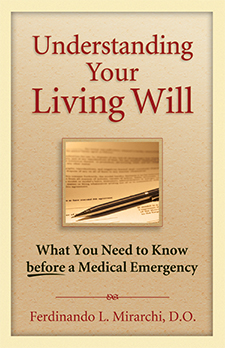 What are the hidden dangers in living wills? How can you avoid the misinterpretation of a DNR code status? When does a living will become active? Why is it important to have a health care power of attorney?